The Continued Learning Scholarship is offered every year. We open it for students who are eager to share with us their thoughts on our chosen sub-theme. The winning student will be rewarded with $1,000 and will have a chance to be published in our website. Application may come from any continent, but will only be considered if submitted by a bona fide university student who has never won this scholarship before. Official enrollment document as proof will also be required. Application is 100% free. State in your essay your personal viewpoints on anything about the people still learning new things even after their retirement. You may choose to explain why learning is still necessary for retired people, or you may highlight an institution that provides lifelong learning for seniors. Any interesting personal belief or opinion on the topic will also suffice. Send your application to scholarship@chicagoexcelclasses.com. *The basic info sheet is required as we will contact the winner and the prize check will also be directly mailed to the winner’s home address. Anything written in the sheet will remain confidential and safe. 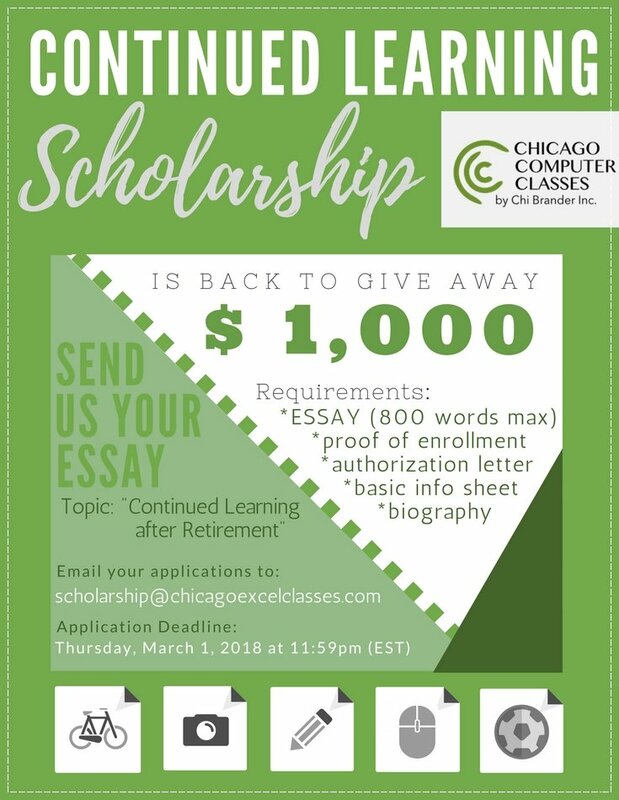 I, (Your Name), a university student of (Your School), hereby authorize chicagoexcelclasses.com to use and edit my essay titled “Continued Learning after Retirement.” Likewise, chicagoexcelclasses.com may publish the material to their website. Applications will close on Thursday, March 1, 2018 at 11:59pm (EST). The winner will be announced five days later. Need to clarify something? Email us at scholarship@chicagoexcelclasses.com. Chicago Excel Classes by Chi Brander Inc. is known for its on-site and hands-on lessons on Microsoft® Excel, location training, VBA coding, and automation in the Chicago area. We cater to most of Excel knowledge needs of people from various backgrounds and levels of computer expertise. We offer highly customizable curriculums and great professional instructors. We are believers of continued learning and we continuously support a big learning population, the university students.